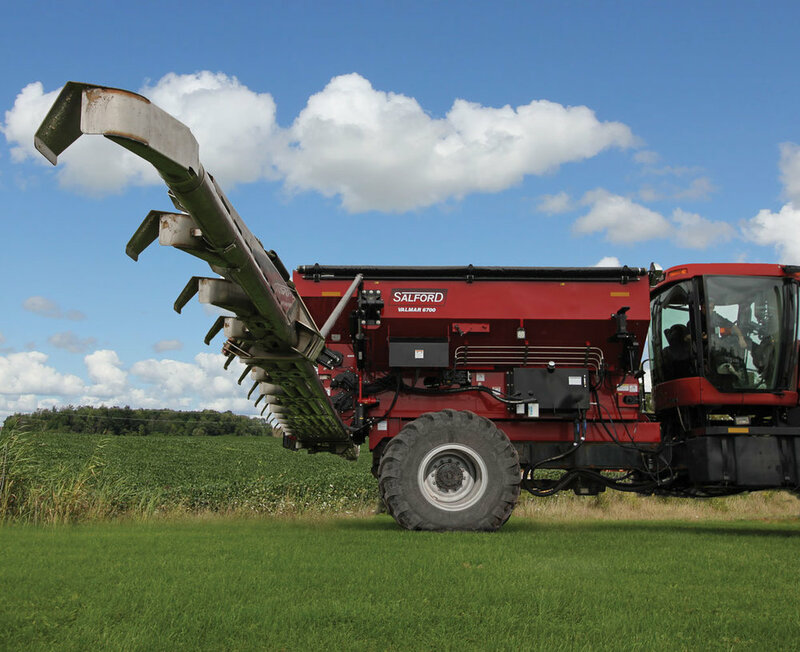 This new Salford 6700 chassis mounted air boom applicator is engineered for select Case IH floater chassis. With a 70 ft application width and the versatile new hopper you can accurately meter one, two or three products at once allowing you to apply granular fertilizer, granular herbicide or combinations of products, in one pass. This new Salford 6700 for Case IH® chassis mounted air boom applicator is engineered for select Case IH® floater chassis. With a 70 ft application width and the versatile new hopper you can accurately meter one, two or three products at once allowing you to apply granular fertilizer, granular herbicide or combinations of products, in one pass. This new 6700 AB350CF is capable of applying one, two, or three products at once with various hopper configurations. Empty hoppers can be adjusted in seconds. No tools or bin inserts required. The 6700 for Case IH® features Valmar’s Venturi metering design with proven reliability and simple maintenance. Reduce application overlap and save on input costs with variable rate application and left/right section control. Engineered specifically for the Case IH® Titan 20, 30 and 40 series floater chassis, this 6700 model will integrate seamlessly with your chassis. The bins 1 & 2 bin of the hopper has dual 16-inch stainless steel chain mesh conveyors that allow for two section (LH and RH) ON/OFF controls. This is driven by the chassis’ auxiliary tandem hydraulic pumps supplied with 6700 and controlled by the ISOBUS ECU. The micro-nutrient metering is also two section but metered by LH and RH roller meters. A 28-groove staggered flute or 12-groove straight flute is available to choose from. The micro-nutrient hopper is also hydraulic variable rate controlled. The two-section micro nutrient hopper, metered with either 28-groove staggered flute or 12-groove straight flute, is also variable rate controlled. The patent pending air booms on the 6700 are rear mounted, to minimize accumulation of fertilizer on the chassis, and are made from 304 stainless steel with a spread width of 70 feet. The booms are two-section, hydraulically folding, with a spring-loaded breakaway on the tip. The booms feature hydraulic suspension, with accumulators for stability at higher field speeds. The tip of each boom can be independently raised and lowered during operation with manual hydraulic controls from inside the cab. The venturi air manifold system is supplied by a 22 inch hydraulically driven fan. Pre-installed harnessing for Raven RCM ECU which is supplied by dealer. The ISOBUS controller offers full swath variable rate and LH/RH section control capability. For Case IH® Titan Floater Chassis, the 6700 can also be ordered as “rate control ready”, which includes all sensors, flow control valves, and the main implement harness. PWM valves are used to control the chains and roller motors, giving the system quick response times for changing application rates. Boom functions are controlled using a switch box which is mounted neatly into the cab console. The 6700 is ideal for broadcast application of granular fertilizer. The 6700’s micro hopper is also capable of metering granular chemicals, cover crops and micro-nutrients. The hopper comes with tandem pumps, bolt on PTO ad extension for Allison transmission, work lights with harness to cab, light brackets and adapters for Case IH® chassis road lights and Case IH® fender kit adapter bracket. For ease of installation, the hopper comes with 4 lift points for installation. Additional standard features for easy installation include: lighting and ISOBUS quick connections, along with mounting hardware. - Up to 3 Compartments (2 x Main Products + 1 Micronutrient/Cover Crop/Granular Chemical) Adjustable flip gate system between bins. - Configuration Apply one, two, or three products at once with various hopper configurations. - 350 cu / ft total struck capacity (see chart). - Tandem hydraulic pumps coupled via PTO to Allison transmission. - Suction lines lines from chassis reservoir. - Suplementary cooling system inegrated with fan. - PWM flow control on meters. - Master hydraulic activation on cab console joystick. - Electro-hydraulic boom fold with independent LH / RH folding capability. - All boom functions integrated into cab console joystick. - Full integration into cab console switch gear and ISOBUS display.